In Balloon Celebration, Basic Black, Party Panda's, Real Red, Sale a Bration, Stampdelicious, Stampin' Up! Although this stamp set has now retired following it being a real winner from Sale a Bration, I just had to share this card with you featuring the Party Panda’s. I love the Party Panda’s, the card is full of colour and I am so proud of the balloons and how glossy they look! we won’t look too closely at the Panda Square as it is just slightly off kilter! Colour is a big thing with my cards, whether it is for corodinating my accessories – which Stampin’ Up! just does so incredibly well – or just as a pick me up for a friend who is blue…. This card is for an older male friend of my husband. His health has not been so good in recent years but his sense of humour has always been impeccable. The bright balloons perfectly reflect his attitude to life: light, bright and full of lift! I am not going to give ou a product list on this occasion but I am going to ask you a question. What colour or colours do you use to lift a mood? I look forward to you responses….just add your comments below and remember to stamp your place in the world! I promised you late last week that I would show you how to easily upscale two cards – and here they are! This was our original card – Whisper White, Peekaboo Peach, Flirty Flamingo, and Sweet SugarPlum card stock, Sweet Sugar Plum ink to stamp the sentiment. 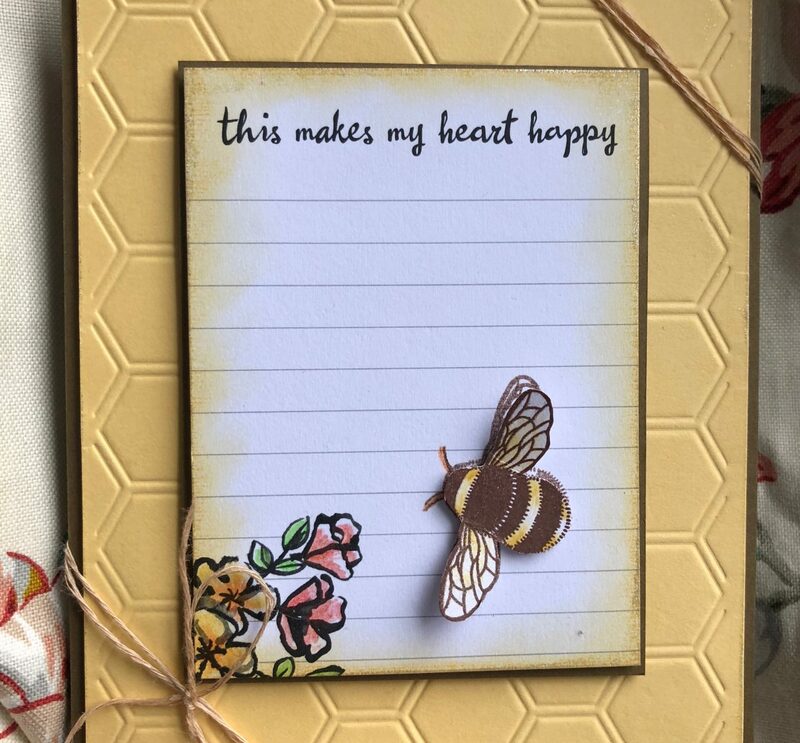 I have used Layering Love sentiment, and the lovely Swirly Scribbles thinlits for the die cuts with pearls to finish off with. It is a simple card. And this is the updated, upscaled version! I have matted and layered the Layering Love sentiment, adding dimensionals between each layer to give depth, and die cut a few more flowers using the Peekaboo Peach and Flirty Flamingo card stock (great way to use p scraps of card stock too!). Again a clean and simple card using Whisper White, Emerald Envy and Flirty Flamingo card stock and Emerald Envy and Flirty Flamingo to stamp the images which are from Balloon Celebration and Layering Love. The whole card was then finished off with a few sequins in Blushing Bride. I hope you like how I have upscaled these two clean and simple cards to give them a little more impact. Create and call it a job – Get two FREE stamps sets in your starter kit when you join Stampin’ Up! in June 2016!! When you join during the month of June, we will help you get started right by adding two extra stamp sets to your Starter Kit! The only catch is that you have to choose the extra stamp sets that you want—there’s no way you’re going to trick us into making such a hard decision. You get to choose two FREE stamps sets of your choice! That’s an added value of up to 126 €/£92, depending on which stamps you choose. So go ahead and get your business off to a fast start. Choose your stamp sets and click the link here to start an exciting and flexible new career…and join my wonderful team of girls – The Stampin Gals. So if you are thinking of spending around £99 on new season products why not take advantage of this wonderful offer and grab yourself a couple of new stamp sets in the process? Next time I will have some more wonderful new Stampin’ Up products to share with you – a couple of the new bundles available with some incredible offers to save you money and build up your craft stash! I am so excited – I am waiting on a shipment of products coming from Stampin’ Up with NEW PRODUCTS from the new Stampin’ Up! Annual Catalogue 2016-17!!! They are on the way and due here any day now! So much loveliness in one box and it is winging it’s way directly to me! if you haven’t got your copy yet then please head over to my online shop where you can see the products in their loveliness or email me and I will be happy to send you a paper copy – my email is stampdelicious@gmail.com and there is a small charge of £3.95 per copy which can be paid via Paypal or bank card/credit card through PaypalHere. Here is a clean and simple project using some of the new In-Colours for 2016-18 while we wait! I am really pleased with how simple this is – I have teamed Emerald Envy (NEW COLOUR) card stock with Whisper White and Sweet Sugar Plum(NEW COLOUR) – this is fast becoming a new favourite! I used the same colours in ink pads. The stamp sets are Balloon Celebration and Layering Loveliness (NEW STAMP SET), both of which can be found in the new Annual Catalogue. Until next time, remember to stamp your place in the world! In In-colours, New Catalogue, New Joining Offer, New Products, Stampdelicious, Stampin Up, Stampin' Up! Well June is upon us and a whole year has gone by since last we chatted – yep a whole year! Doesn’t seem that way to me either but I know a lot has changed in my life…But more importantly what is happening in the Stampin’ Up! craft world? Well a New Catalogue, that’s what! A New Catalogue 2016 – Stampin’ Up! 1st of June sees the new catalogue launching! Yippee – you can download a digital copy by clicking on the image link above. If you want a paper copy please email me on stampdelicious@gmail.com – I will give you paypal details for ordering you paper copy – paper copies cost £3.95 and are packed full of ideas. I am so excited to be bringing you new products for a new season – I will begin to upload new projects as soon as possible….but I have so many new favourites it’s hard to know where to start…. In Lets Get Away, Project Life, So You, Stampdelicious, Stampin Up Spring Catalogue, Stampin' Up! So that took waaaaay longer than I was expecting! BUT I do finally have a bit of a finished project for you – I really enjoyed making this Project life page and was surprised at how easy it was once I got going. Okay lets get to the pics! First pic is the original Project Life by Becky Higgins, Stampin’ Up! proud and delighted to have Becky designing some exclusive project life items for them. So what you are seeing here is my first box of Project Life that MB bought me last year for my birthday. It has sat on a shelf awaiting inspiration. Now I don’t know how many of you have ever waited for inspiration, but it can be a bit like finding hens teeth! So Stampin’ Up! have their exclusive box and because I consider myself to be a Project Lifer I bought it!!! I was thrilled! I opened the box and was delighted with the contents. The contents were all about travel which was PERFECT because I intended – when inspiration arrived – to Project life our journeys – we travel around EVERYWHERE….well a lot, what with New Years resolution to spend me us time and my eldest son now living in Forres, and my youngest starting to look at universities…. The pockets can be in different places and give different effects….. I hope you can see these pockets okay….so they layouts can be individual and as unique as you want them to be and nothing stops you popping pages in between to add to your layouts but essentially the point is to illustrate life quickly and easily….So what did I make? I chose New Years eve to make my first page about – and I have a few more pages that I want to make covering New Years Eve. It was a fun and magical time for MB and I. We took the train to London – first time on our own for years – and headed first to Covent Garden for lunch and then the the theatre for a show – but that is for another page….This is page 1…..I used the Stampin’ Up! Lets Get Away Card Collection (137907 £13.50) and Accessory pack (137908) £8.50 – I have mountains left from each pack so will get loads more pages done with what I have. I do hope that you give Project Life a go – I was amazed how quickly it came together, lots of cards and backgrounds already prepared and ready to go – already colour co-ordinated – just brilliant! The front page has a wooden sheet plus stickers! Backgrounds, arrows, washi tape – everything you want to get on the road to capturing those special days quickly and easily! Okay, that was a quick trip to Project Life – I will be featuring ore of this around once or twice a month and building mini book up and my main Project life album….I hope you will join me on this journey of discovery! In Basic Black, Chalkboard paper, ColorBox Chalk ink pad, Hello Life, Spring/Summer Catalogue, Stampdelicious, Stampin Up, Stampin Up Spring Catalogue, Stampin' Up! I am delighted to sit and write this blog entry tonight! It has been a most busy week since I blogged with you last – mostly boring stuff like work but I was delighted by my eldest son ‘popping’ home for the weekend. He is in his first year of his post grad job and working and living in Forres in Scotland – a long way from where we live. Obviously, we don’t get to see him as much as we would like, however, his work brought him closer to home this last week, to Glasgow and when he found he was going to have to stay in Glasgow for a further week with his work he decided to head home. Not a hard decision I guess: four hours from Glasgow to Forres, do his own washing and then four hours back on Sunday or an hour and fifteen minutes from Glasgow to Carlisle, MUM will do the washing and then an hour and fifteen back on Sunday…NO CONTEST! Terrific to see him and spend time with him even if it has meant a very hectic weekend. So, I promised I would do a Project Life project this time around, and I fully intended to. My printer however, had other plans and when I started printing photo’s out on it, they got progressively worse. My son – see above – informs me that what I really really need is a printer that prints photo’s and not a document printer that will crank out the odd pic now and again! New photo printer duly ordered! I have used the `Hello Life Project Kit (137949 £22.95) to show off these pictures. Now I am always a little wary of kits I have bought elsewhere as they never seem to have enough to make a solid project and you always have to add to them, but when this arrived and I was going through the items, I quickly realised there was almost enough kit to do this twice!!! so a very generous kit indeed and it comes with the metal frame as well so DOUBLE BRILLIANT!!! I really love the die cuts and the letters ( lots and lots of letters!!) in the Hello Life Project Kit, all the little silver spring pegs are included as well as the Bakers twine. There is some fabulous Crushed Curry ultra thick twine to make pompoms but I decided to not use them this time around as I have another set of pics in mind for the pompoms. But they are in the kit! You can also make this little shaker heart frame and all the little hearts in Basic Black, Silver and Crushed Curry are all included as well as a self adhesive foam circle to make it easy as pie to make. Yes, those are Giant M&M’s ….. The kit is teamed with a Photopolymer stamp set – Hello Life (137136 – £22.95) which has 10 stamps in the set and will get lots of use on other projects!!! Perfect for Valentines as well as other occasions. You can see I have used the heart stamps with Whisper White stamp pad on BlackBoard card stock. These would look brilliant in any of the new Color Box Chalk Ink colours that feature in the Spring Summer catalogue which can be viewed HERE. All in all, I think this is a fabulous project kit – whether you use it yourself or gift it to someone you know has an event to say Hello Life about…..If you want to purchase this kit or any other Stampin’ Up! item, please either email me on stampdelicious@gmail.com or visit my online Stampin’ Up! shop where you can shop 24 hours a day! Here is a link to the online Stampin’ Up! shop right here. Sale-a-Bration is ON! and Hello Valentine! I said I would be back and I am – this is the first of this months posts where I am hoping to be a bit of an enabler….I have A Valentines Tutorial for you. In the not too distant future I am hoping to be able to bring you video, however, for the moment I have pictures!!! But…before that I just want to remind you that Sale-a-Bration is on! Sale-a-Bration…What is it all about? Sale-a-Bration is the time to Earn FREE Products!!!! It is an amazing EVENT perfect for Crafters! It’s the best time of year to host a Stampin’ Up! workshop because you get extra host benefits, and your guests can earn free product! Contact me for more details on stampdelicious@gmail.com. Been thinking of joining my team? As an extra goodie, you can choose a spring/summer catalogue kit or 2 Sale-A-Bration items for free! New members of my team who sign up during Sale-A-Bration can choose between getting a free Occasions Kit or two Sale-A-Bration items. It’s the best deal of the year! Can’t decide which Sale-A-Bration item is your favorite? Join my team and you can pick two Sale-A-Bration items for free! You can join my team right now by clicking HERE and start choosing your favourite items for your kit and pick two Sale-A-Bration items FOR FREE! View the Sale-a-Bration brochure HERE. I will list the products I have used at the end…. 1. I took a piece of 12 x 12 Whisper White card stock and cut it to 6 x 12 then scored at the 6 inch mark folding it to make my card base. 2. I then cut a piece of Real Red card 6′ x 2 1/4′. I embossed this using the Happy Heart embossing folder. 3. Then using the Chalk Board cardstock I punched out 6 hearts – my punch is the old heart punch but there is a gorgeous new one which I will give you details of below. I also used some old DSP which has red glitter polka dots on. 4. The DSP hearts I folded in half but the Chalk Board ones are sturdier so I used my Scoreboard to score them down the middle before folding them and glueing them together with Tombow wet glue – this has to be the BEST wet glue on the market – you get a minute or so to maneuvre your card around into place before it grabs and holds firm! Once these were glued and folded I popped them under a punch while they dried. 5. Taking my Stamp a Majig, my photopolymer stampset Hello Life and Basic Black ink pad, I then stamped onto the polysheet, making sure to line my stampblock right into the corner of my Stamp a Majig. I then lined this up onto my card base. 6. I stamped the ‘Love’ and heart on a line from Hello Life and ‘You’ and ‘So Much’ from Crazy About You. I really love the photopolymer stamps, they are so easy to position and get just right. To get the red heart I inked up the whole image then carefully wiped away the Basic Black ink from the heart. I then used my Real Red Stampin’ Write marker to ‘ink’ up the heart just before stamping on my card. Once this was all done, I assembled my card….I attached the embossed, Real Red strip with the hearts, glued on my 3d hearts and added a little sparkle to the tiny red heart. And here is the finished card….. If there is anything that you would like to buy please head over to here where you can place an order 24 hours a day!!!! and remember if it is £45 or more you will get to choose a FREE item from the Sale – a – Bration products as well!